Motion and I don’t get along very well. 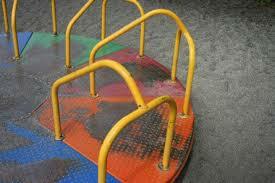 I have been known to get nauseous on merry-go-rounds at the park as a child. The world goes round and round . . . and my stomach with it. Unlike some people, the key for me is to always eat well before traveling lest nausea set in for the entire trip. Unfortunately, there have been times when I wasn’t so diligent to grab enough grub beforehand. The result? A frantic grab for “the bag” in front of me on a plane ride from Canada. Thankfully, the newlyweds across the aisle from me were more compassionate than grossed out. It was just another reminder for me to give my tummy some extra tender-loving care before motion ensued. Unlike myself, I think the devil likes merry-go-rounds. He has a nasty habit of sending people’s life into a vicious cycle of constant nausea, one problem after another. John 10:10a says, “The thief does not come except to steal, and to kill, and to destroy . . .” As he sends a “merry-go-round” our way, we can picture him clapping his hands together in anticipation. Let the nausea begin! “Merry-go-rounds” can come in all shapes, sizes, and colors. They may come in the form of depression and sorrow. They may appear as sickness and disease, poverty and destruction. They may even come disguised as people, bearing strife and unrest. If the devil can get us on one of these, he knows there’s a chance he can take us out, destroying our stability and peace. Unless we get help, we’re left miserable and less effective for the Kingdom of God. Though the devil seems to get a great amount of glee from making us nauseous, we don’t have to stay on the ride. The answer is in James 4:7, “Therefore, submit to God. Resist the devil and he will flee from you.” How do we resist? We rise up in the middle of it all and believe God’s Word. We choose not to focus on the devil’s lies but to focus on the person of Jesus. We use our authority and tell the devil to stop his annoying merry-go-round antics (John 10:19). When we do, we put the devil on his own nauseous ride. Jesus did it on the Cross, so we can freely remind the devil of what it was like.